1. Heat a griddle pan until hot. Brush the aubergine slices with the oil and cook in batches, until tender and charred. Remove from the pan and brush with the harissa. 2. Place the tahini in a small bowl and mix in the yogurt with the garlic, lemon juice and1 tbsp water. Whisk to combine and season. 3. 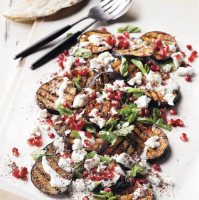 Arrange the warm harissa aubergine over a serving plate, drizzle with the dressing and scatter over the feta, mint leaves, sumac and pomegranate seeds. Serve with warm pitta breads.